Step on board, present your ‘Octopus’ card and take your seat! 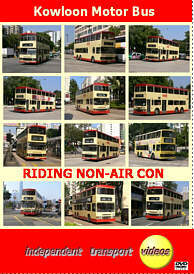 independent transport videos are proud to present this special video programme featuring rides on the once huge fleet of non air conditioned vehicles operated by the Kowloon Motor Bus company in Hong Kong. The remaining fleet consists of 11 metre Alexander bodied Leyland and Volvo Olympians and 11 metre Dennis Dragons with Duple Metsec bodywork. It is thought that these non air-con vehicles will be replaced over the next three years or so. Most routes share non air-con with fully air conditioned vehicles, although route 70 from Jordan to Sheung Shui is still almost 100% non-air con. We feature most of this route on this video – the actual service takes around 1 hour and 45 minutes each way! The programme starts at Kwun Tong with a ride on the upper deck of a Leyland Olympian on Route 93A to Po Lam, returning to Kwun Tong, this time on the busy lower deck of the same vehicle. Next is a ride on a Dennis Dragon from Kwun Tong to Tsz Wan Shan on route 3D. We then ride from Tsim Sha Tsui on another Dragon to Lai Chi Kok on service 6A. From Mei Foo we join a Volvo Olympian for a spirited ride to Lei Muk Shue on the 36A. We then board a Leyland Olympian and ride to Tsuen Wan West Station on route 36. From Tai Kok Tsui we change to a Dragon for the 13D service to Kwun Tong. The final ride is a brief night time one from Tsim Sha Tsui on board a Leyland Olympian along Nathan Road. Plenty of atmosphere, you can enjoy all the sights and sounds of these fine vehicles. The only thing we cannot reproduce is the warm breezes blowing through the buses, nor the myriad of exotic pungent smells that also permutate through the vehicles! So sit down and enjoy the ride.